Traveling with kids can be such a rewarding experience. Getting to share your favorite spots with them, seeing the look of wonderment on their faces, and making unique memories that will last a lifetime make it all worthwhile. But it can be easy to forget about all of those joys when you’re six hours into what probably feels like the longest drive of your life. We’ve all been there. 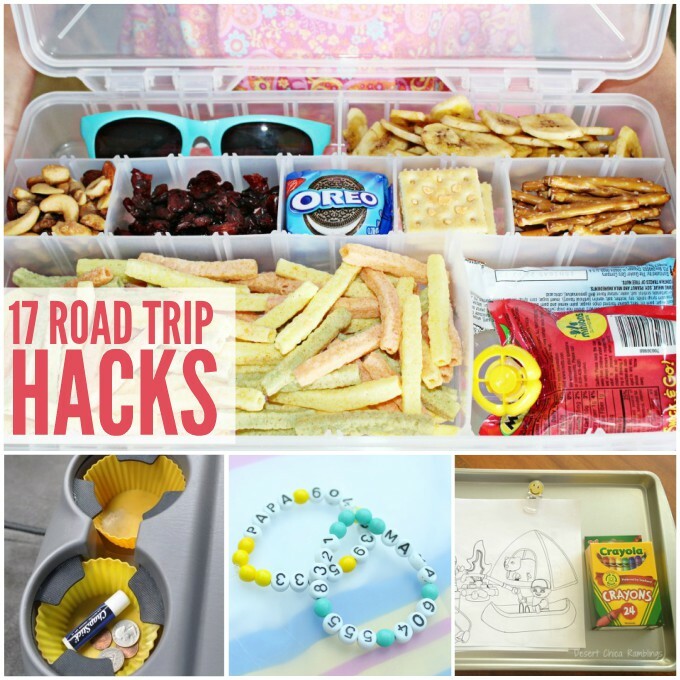 To help you keep your sanity, here’s a list of 17 Road Trip Hacks that will make your drive a lot more enjoyable. Plan Outfits in Advance. Save time by picking out your child’s outfits before the trip. Keep the outfits together by putting them in separate Ziplock bags. 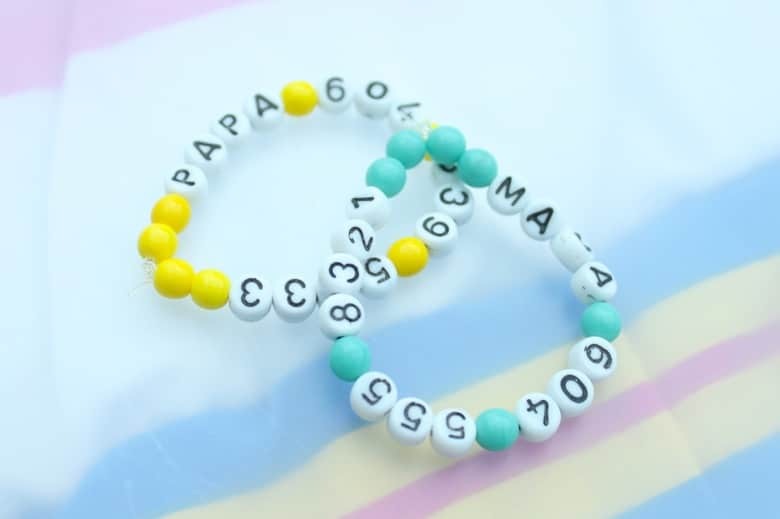 Make Phone Number Bracelets for Your Child. Use numbered beads and decorative beads to create a pretty and practical bracelet for your child to wear while you’re out and about. Should you get separated, someone will be able to contact you. Bring Dryer Sheets. Dryer sheets will help keep your car smelling fresh no matter what happens on your drive. 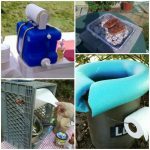 Plus, they’re easier to pack than other deodorizing options. Make Your Own Audiobook. Instead of spending money on audiobooks, use a voice recording app on your smartphone to record yourself reading your child’s favorite books and play them during your drive. Cover Your Seats with Sheets. Put old sheets over the seats of your car to catch crumbs and prevent spills from ruining your car. Bring an Activity Book. We’ve put together a dry erase travel activity book with several printables you can use for FREE. Just laminate the pages or put them in sheet protectors, and give the kids dry erase markers to use. Put Cling Wrap over Your Cups. If your kids are too old for sippy cups, but too young to avoid spills, cling wrap can be used as a makeshift lid. 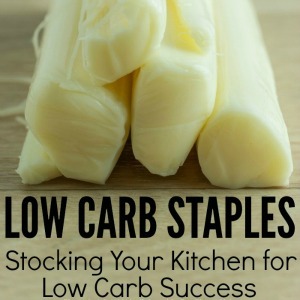 Just pull it tightly over the top, and stick a straw through it to prevent messes. Put a Cup over Seatbelts. Trim down a disposable plastic cup, put it over the buckle, and cut a slit at the base just big enough for the latch. That way, your kids can’t unbuckle themselves throughout the drive. Line Your Cup Holders. 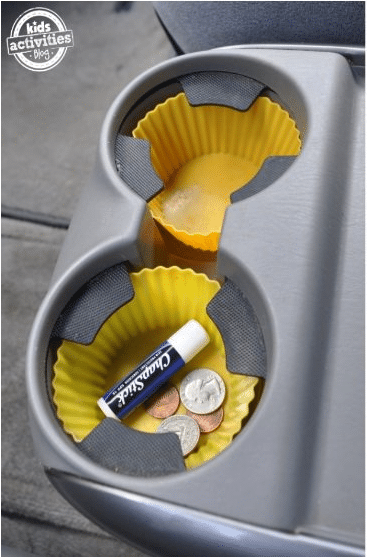 Put cupcake liners in your cup holders to keep them from getting sticky. 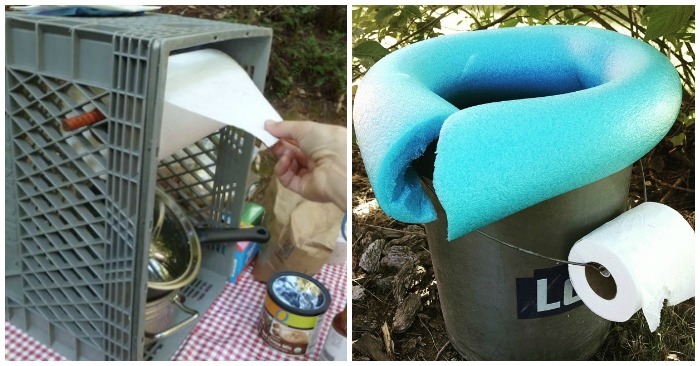 Make Your Own First Aid Kit. Don’t rely on other people having a first kit available. Build your own before you leave, in case of emergency. 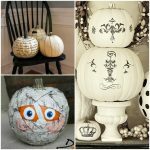 Include bandages, antibiotic ointment, and Tylenol. 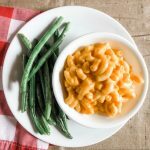 Make a Travel Itinerary. 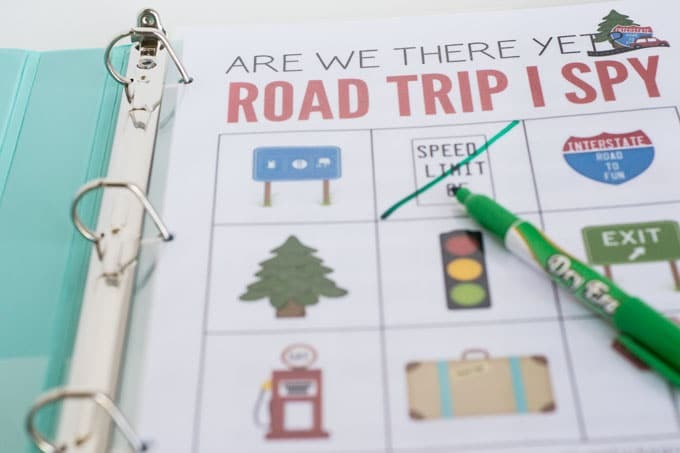 Print out pictures of fun things that you’ll be doing on your trip as well as things you’ll be seeing on your drive. 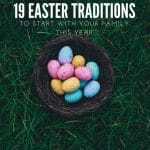 Turn them into a little book for your kids to look through to keep them excited during your road trip. Tie Important Items Down. If your kids have a tendency to drop their favorite things onto the floor of the car, try using a string to tie sippy cups and toys to a non-essential part of the car seat. That way, your child can just pull their items right back up. No tears necessary. Bring a Travel Tray. 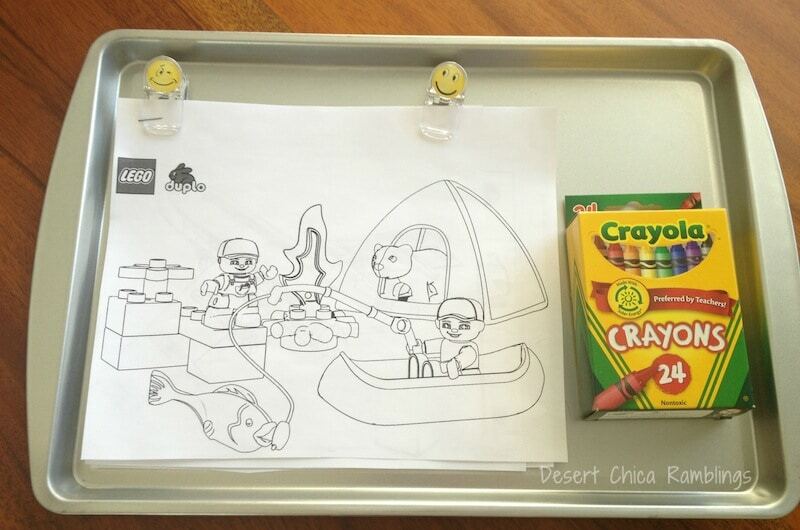 Travel trays will help if your kids need a snack or want to color while you’re on the road. Freeze Juice Boxes. Instead of using ice to keep the food and drinks in your cooler at the right temperature, try freezing juice boxes instead. It will keep everything cool, and your kids can drink them after they thaw. Prepare Goodie Bags. Before you leave, put some inexpensive toys, snacks, and other fun items into separate paper lunch bags. Pull one out if your kids get a little restless during the trip. 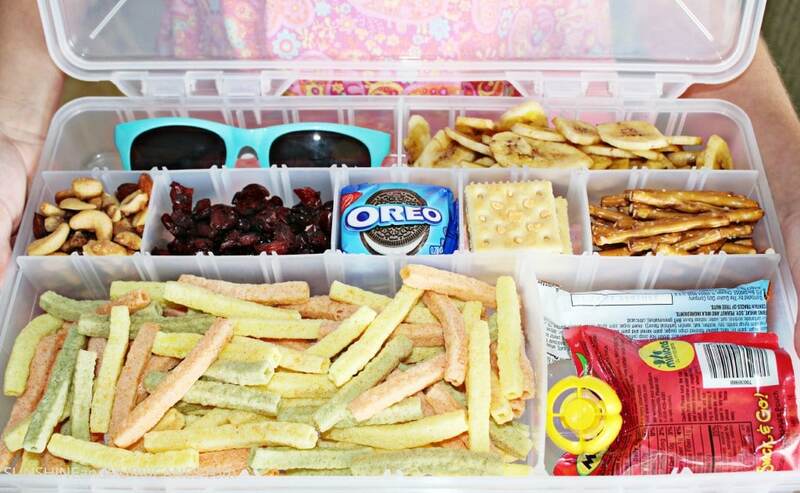 Use a Tackle Box to Organize Snacks. 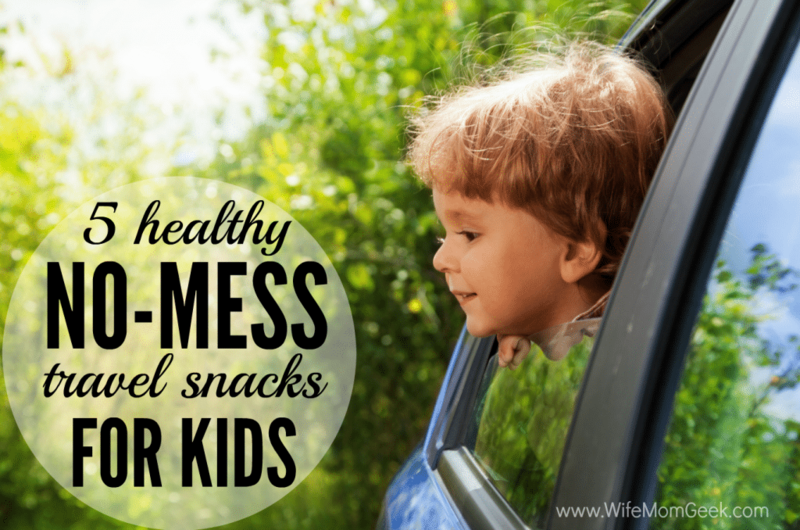 Make sure your kids are getting healthy snacks, even when you’re on the road, by using a clean tackle box to hold a variety of snacks. 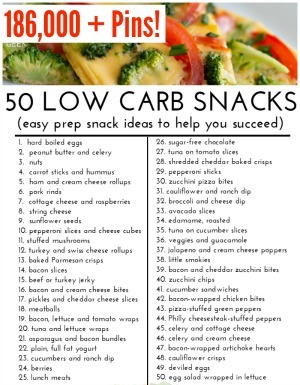 Try adding things like cereal, nuts, and pretzels. Play Road Trip Bingo. Print out a blank Bingo sheet, and fill the boxes in with things you might find along the way. 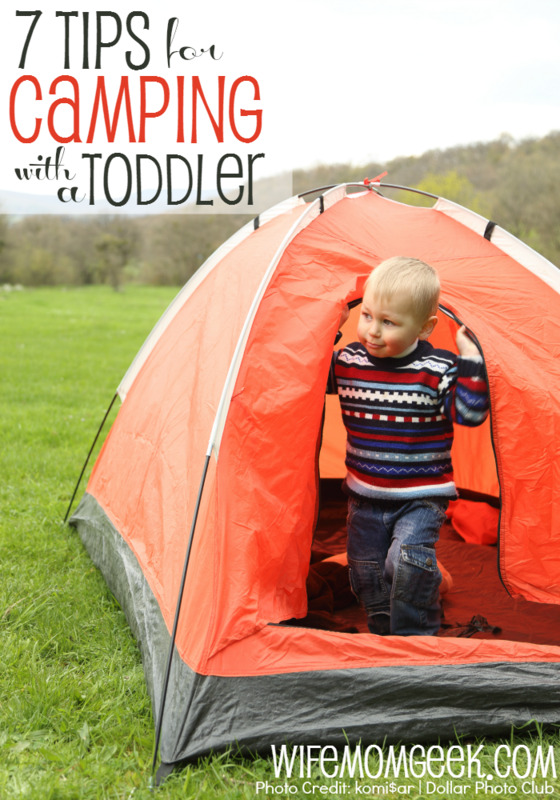 A great way to keep kids entertained and engaged in the trip. Organize Your Trip with a Shoe Organizer. Put an over-the-door shoe organizer over your passenger seat to keep toys, diapers, books, wipes, and whatever else you need within reach. Hopefully, these hacks will help you to enjoy your next road trip. And who knows? You just might find that the journey can be as fun and rewarding as the destination. I loved the idea about making bracelets with your phone number for kids in case they get separated. I will be doing this for our trip to Canada this summer! That’s my favorite idea from the list, too! 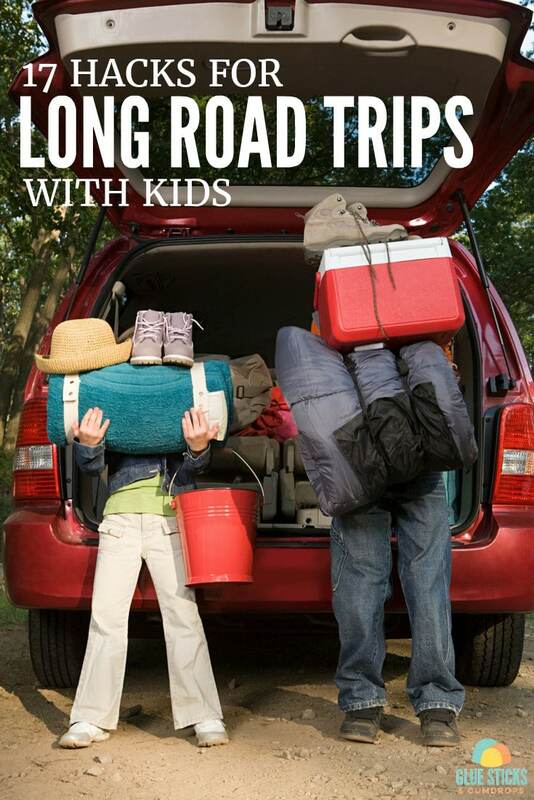 Our local library has a large selection of audiobooks that are great for road trips. You can even download audiobooks to your phone with your library card!